To make these soft, leather-like vinyl menu covers, we use seal and sewn construction. One area stamp and deboss in gold, or silver is included. 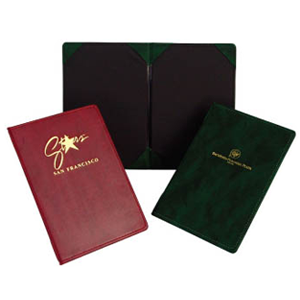 The Ambassador menu covers are designed to resemble subtle yet elegant leather binder material. The design comprises soft thick vinyl covers that are manufactured to resemble genuine leather. Gold or silver one area stamps are utilized to beautifully deboss the front covers with the name of your establishment and logo.